I think it'd be safe to say that Daft Punk's Random Access Memories has been one of 2013's most highly anticipated albums. As the first full-length album to follow up their 2010 soundtrack to TRON: Legacy, many people were wondering what they'd do next, having evolved so consistently since their debut, Homework, in 1997. Work on Random Access Memories actually began concurrently with the TRON: Legacy soundtrack, though there was no clear structure at the time as to where the record was headed. The album has been referred to by many as Daft Punk's Kid A, a reference to Radiohead's album of the same name, comparable, as it was their first venture into a more experimental sound than their first three albums. Also notable about Random Access Memories, is Daft Punk's use of live instrumentation and session musicians, limiting their prior electronic sound to the use of drum machines, a modular synthesizer, and vintage vocoders. 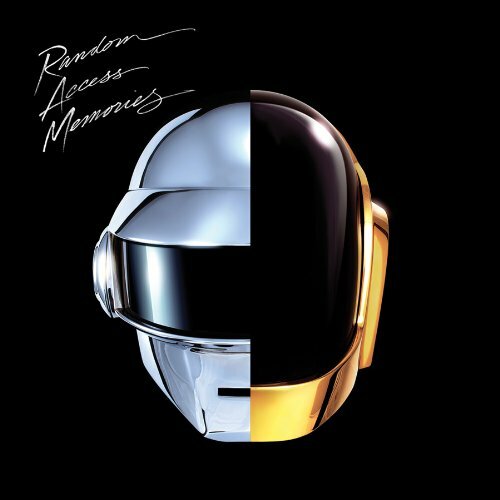 Through the course of the five years since the album's inception, Daft Punk collaborated with many notable musicians for tracks appearing here, including Chic's Nile Rodgers, The Neptunes' Pharrell Williams, The Strokes' Julian Casablancas, Animal Collective's Panda Bear, and legendary producer Georgio Moroder. A web series titled The Collaborators was developed to provide insight into these collaborations, and currently consists of eight episodes. The series is available for viewing on the Random Access Memories website, and is fairly interesting. I usually don't fall for major label lead singles. They're generally an accessibility drop, designed for airplay, to generate buzz. Most times, they fail to represent the album as a whole, and sometimes even murder artist integrity. The first time that I heard Get Lucky, the lead single, I assumed that it was just that. Having heard none of the rest of the album for comparison, and knowing Daft Punk's usual sound, it just felt fake, like a ploy for new listeners. Even as a fan of Pharrell William's work with N.E.R.D. and The Neptunes, I just didn't care for it. I first had a chance to listen to the album in its entirety a few weeks ago, blinking my eyes in confusion as I realized that what Daft Punk had done, was create an entire album that could fill in the space around Get Lucky's place in the tracklist with a brand new sound, evolving once again. During the first spin, everything feels pretty good, and there are plenty of hooks to draw you in. There are more than a handful of tracks that keep pace with Get Lucky's modern disco feel, including Lose Yourself to Dance (also featuring Pharrell Williams and Nile Rodgers), and Give Life Back to Music. There are a handful of tracks that will also be familiar to fans of Daft Punk's more electronic roots, such as Motherboard, and Contact. On first listen, Random Access Memories is a strong effort, that proves that Daft Punk can evolve their sound on each album, and not get stale, while experimenting within a sound field that they're comfortable enough in to excel. Having spent more than a week with the album now, the amount of hype surrounding it seems really legit. Switching to the Édition Studio Masters makes a serious difference, especially with quality headphones, and is surely the edition you're going to want if you're a fan of this record. The Japanese retail edition is identical to the US release in sound quality, but contains the bonus track Horizon. It's been theorized that Horizon was cut shorter than intended, due to the 74 minute limitation the archaic compact disc presents. I consider Horizon a good track, similar in style to Motherboard, but I wouldn't say it's worth the import cost of the Japanese disc for us Americans. I really liked Instant Crush the first time I heard it, but the more I listened to it, the better it got. It's Outside of what you'd expect from The Strokes' Julian Casablancas, but vocoder adds a great element to his vocal style here.